Since their beginnings in 1996, Cape Cod Provisions has expanded far beyond just their beloved cranberry, to offer decadent, on-trend and crave-worthy indulgences. 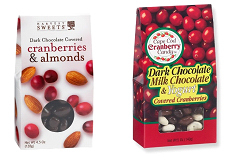 They now have fivedistinct families of specialty chocolate confections: Harvest Sweets® chocolate covered fruits, chocolate covered fruits & nuts blends, and fruit filled truffles; Cape Cod Cranberry chocolate items; and Sweet Cravings® dessert truffles. They proudly serve specialty market segments across the country and beyond. Great packaging & excellent price points too! Mama Monacelli’s offers a true taste of yesteryear. The flavors that emanated from family kitchens two and three generations ago are found in their packages. There are no shortcuts to truly superior candies. Each small batch of our gluten-free, artisanal candy is lovingly crafted to ensure true homemade goodness. Their offerings include English Toffee, Peanut Brittle, Glazed Almonds in 5 flavors, Ginger Nut Mix, Cashew Brittle, 5 Chocolate Barks and 2 layered Barks, Peppermint & Maple. Available in packages of 2 oz, 4 oz and 8 ozassorted sizes, these candies make the perfect gift for that special occasion - or no occasion at all! Treat your friends, your loved ones and yourself to the best, to Mama Monacelli's! 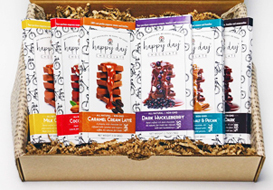 Happy Day Chocolates are created through Full Circle Exchange, a non-profit social enterprise dedicated to empowering women and whole communities to rise above poverty through training, education, design partnerships, and sustainable economic opportunities. Rather than creating dependency on aid, Full Circle Exchange takes a market-based approach to alleviate poverty by advancing entrepreneurial solutions rooted in the dignity and creative capacity of the individual. All chocolate bars are all natural chocolate bars packaged and hand signed by the women who made the chocolate and assembled it. They make 2.75 oz chocolate bars in 9 different flavors such as Dark Chocolate with Almonds & Sea Salt, Milk Caramel Creme Latte, and Dark Huckleberry Bars. All have beautiful packaging, with the Happy Day story of empowerment on the back. They also have some excellent Chocolate Barks in 4.5 oz resealable bags, with 3 flavors available. All of these Happy Day chocolates have been a bit hit for us so far! Olivia Chocolatiers is a new chocolate maker dedicated to making only 2 categories of Organic chocolate bars. First is their raw, high percentage dark chocolate that is, full, rich and surprisingly not bitter tasting. 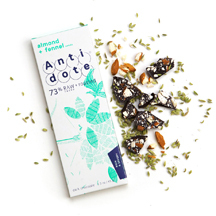 And perhaps even more unique, they have perfected a line of dairy-free milk chocolate bars that have to be tasted to be believed! The Raw Dark bars come in 6 varieties, including 76% Dark, 86%, 92%, 100% (!) (meaning no sugar at all! ), 76% with a touch of Maple, and 76% with Maple Flakes. And the Dairy Free (Vegan) "milk" bars come in a coconut milk bar, coconut chai bar, and a hemp milk bar. They also have little mini bars available in most of these flavors, with an acrylic displayer available for the mini bars. In the words of the founder of Olivia, David A. MacDonald: "The Olivia Chocolat line delivers the finest, most decedent and unique chocolate taste using our own proprietary process. 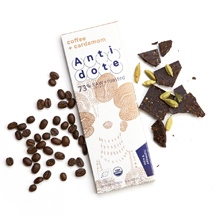 Our chocolate is far from candy; conversely, it is a fine and nutritious superfood. 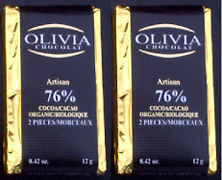 Olivia Chocolat is to be savoured and is ahealthy alternative tomainstream confection. Our chocolate made directly from raw, unroasted cocoa that has a surprisingly smoother, softer taste than roasted cocoa chocolate. We use pure organic maple sugar, raw organic hemp milk and pure raw organic coconut cream in many of our bars". 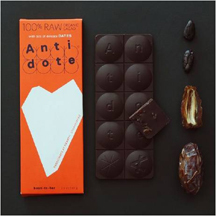 Antidote Chocolate is a true bean-to-bar manufacturer using "Arriba National " cacao from western Ecuador. smooth flavor of roasted cacao beans. This is chocolate for the serious chocolate lover. Exciting flavors include: Coffee & Cardamon, Almond & Fennel, Mango & Juniper, Ginger & Goldenberry, Rose Salt & Lemon, Banana & Cayenne, Essential Vanilla & Nibs, Lavender & Red Salt. Raw 100% Cacao Bar Flavors are RAW cacao & nibs, RAW cacao & dates. Founded in 2002, Dream Chocolate's vision is to help fortify the vision of their customers, "if you have a dream, we can make a chocolate bar for you." 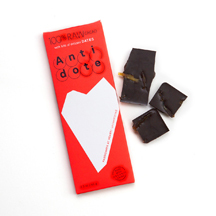 They are dedicated to making high quality chocolate in a socially responsible way. Dream Chocolate Company has found suppliers who share values in preserving the Earth and taking care of the people who grow and produce this wonderful organic food. The cocoa beans are Rainforest Alliance Certified, to make sure their product is grown responsibly and the workers are treated well and paid fairly. These Artisan made chocolate bars are hand poured and hand labeled to maintain a quality crafted product and to provide jobs to local citizens. Idahoans work hard to build a strong community and Dream Chocolate supports other local businesses by manufacturing bars with their own company logo printed on the label. Unique Organic Flavors include: 70% Dark Banana Raspberry, 41% Milk Caramel Creme Latte, 85% Extreme Dark, 70% Dark Sea Salt/Almond, 70% Dark Habanero Mandarin Orange and many others,all available in 3 oz. bars. They also offer Wild Huckleberry flavored chocolate available in 55% Dark, 30% White and 34% Milk Chocolate, Available in 3 oz. and 1.25 oz. bars. The 2 oz Organic bar is wrapped in simple- fully recyclable packaging with clear emphasis on it being non-gmo, gluten-free and soy-free. Available in a wide variety of flavors. The original chocolatier to combine quality chocolate with spicy flavors. Cowgirl Chocolates offer both spicy and mild truffle bars,solid chocolate bars, chocolate truffles and spicy caramels. Brix is no ordinary chocolate. Brix is specially formulated with the finest chocolate from Ghana. Each Brix is designed to complement wine, and draw out its fruity, earthy nuances. 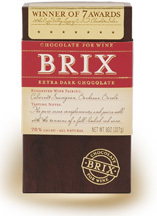 Brix is available in 4 chocolate blends,each to compliment different wines. They range from Extra Dark for Cabernet and Malbec to Milk Chocolate for sweeter wines such as Port and dessert wines. Available in 8 oz. bars, a bite size assorted pack and 4 oz. bars in the Brix collection.